Going to the beach is surely exciting. But there are things that you need to prepare for like the sun, the sand, and the shore. So better pack these beach essentials up to ensure a great swim and more. Most activities at the beach are done outdoors and during the day. This means that you’ll be exposed to the sun’s harmful rays for a long period of time. Thus, it is a must to have these products: lotion with SPF, lip balm with SPF, sun glasses, hat, and umbrella. For maximum protection, reapply the lotion and lip balm after every two hours. What you’re bringing should reflect what you’re going to do in the place you’re heading to. For example, you are to attend a beach wedding or a luau. You’d be required to bring a beach dress then. But if it’s just a typical leisurely trip, here are the must-haves: swim suit, cover up, and extra clothes. Plus, make sure that you bring a container, like plastic bags, in case you need to take home some wet bikini or trunks. Whether you aim to capture every moment of your excursion or you simply want to beat boredom, electronic gadgets are now important when going on a getaway. Hence, you better get a water-proof (and dust-proof) pouch and put these gizmos in it: phone, camera, music player, and charger. You should also anticipate that there would be no place to plug your charger in. Therefore, take with you a power bank to guarantee a full battery of fun. It is not just your electronic devices that would need enough energy to keep up with the party—also you. So have yourself regularly hydrated with water and filled up with at least snack bars and nuts. Bringing your own food and drink not only secures your taste and the health of your tummy, but also lets you save from spending away your pocket money. After all the strolling and swimming, you will need to be washed and dried up. Stock the following, together with a towel: tooth brush, tooth paste, shampoo, conditioner, soap, and facial cleanser. You’ll never know what can happen in your beach adventure, but you can prepare for the worst scenario by carrying with you some money and medicines. You can also add a first aid kit to be extra prepared. 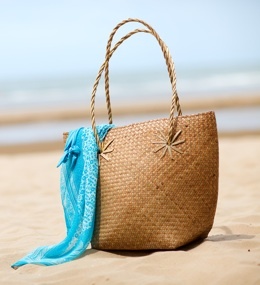 With all the other things that you wish to fill your beach bag with, it is best to choose them according to form and function. That way, you’ll be able to maximize the space in your back pack or hand-carry. In the end, it is all about knowing you have everything you need that makes you enjoy the trip.